Stephen Cornford è attualmente ricercatore al Sound Art Reserch Unit dell'Oxford Brookes University dove co-cura l'Audiograft Festival. Ha studiato scultura alla Slade School of Fine Art prima di completare un master al Dartington College of Arts. Recentemente il suo lavoro è stato presentato in mostre personali a Lydgalleriet (Bergen), Campbell Works (London) e Permanent Gallery (Brighton) e nelle retrospettive Sound Art. Klang als Medium der Kunst allo ZKM Centre for Media & Art (2012-13) e Urban Sounds alla Haus der Elektronische Künste di Basilea (2013). Collabora stabilmente con Samuel Rodgers (con cui cura l'etichetta Consumer Waste), Ben Gwilliam e Patrick Farmer. Il suo lavoro è stato pubblicato da Senufo Editions, Accidie Records, Another Timbre e Cathnor. 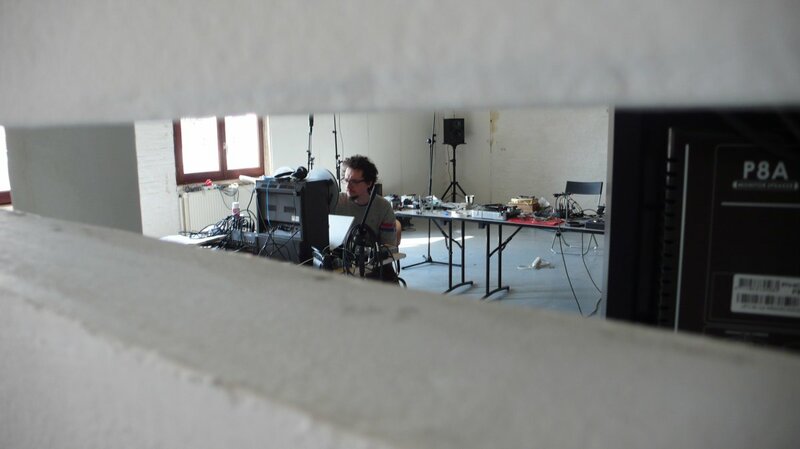 Stephen Cornford (born 1979, London) is an installation artist and improvising musician. His work stems from an abiding fascination with consumer audio electronics: the way these devices that we are sold to consume music increasingly frame our engagement with the auditory world at large. Reconfiguring these media from the inside, re-imagining their functionality, defying their obsolescence and searching for their intrinsic poetry are for him strategies with which to challenge normative use, social conformity and the myth of technological progress. His work inhabits both gallery and gig, taking the forms of kinetic installation and process-based performance by turns, always searching for situations in which the material; whether solid, spatial or sonic; controls the outcome as much as he does. Stephen is currently a Research Fellow at the Sound Art Research Unit of Oxford Brookes University where he co-curates the Audiograft Festival. He initially studied sculpture at the Slade School of Fine Art before completing an MA at Dartington College of Arts. He has established ongoing collaborations with Samuel Rodgers (with whom he runs the Consumer Waste label), Ben Gwilliam and Patrick Farmer. Recent exhibitions include solo shows at Lydgalleriet (Bergen), Campbell Works (London) and Permanent Gallery (Brighton). Stephen’s work has been included in a large scale retrospectives namely: Sound Art at ZKM Centre for Media & Art and Urban Sounds at the Haus der Elektronische Künste in Basel. Stephen’s audio works have been published by Senufo Editions, Accidie Records, Another Timbre and Cathnor.